As Clean & Simple 3: One Layer Cards class continues I’m happy to try new and renew old techniques and card ideas. 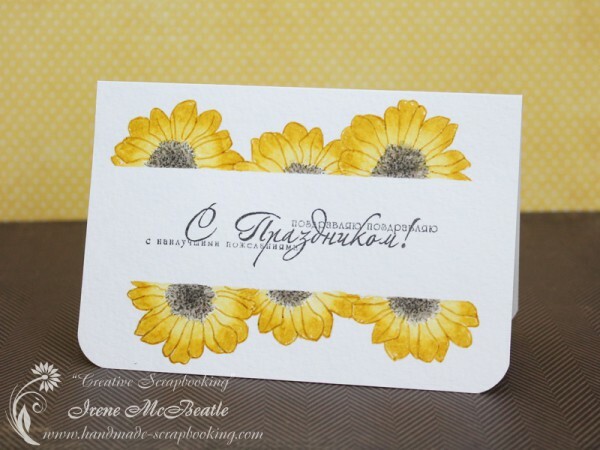 Today I’m showing a card with creative stamp coloring. Despite the simple look of this card it was made with quite a few techniques and the process lasted an hour or so. One image was stamped repeatedly with masking of certain areas. Then it was colored with Distress Markers and wet brush to achieve blended, watercolor look. I outlined the petals after coloring to define the edges of the sunflowers. After removing the masking tape in the middle area I stamped down the sentiment which says “Happy Holiday! Congratulations! Best wishes!” in three lines.